For one Fortune 500 company, activities of the organization are focused on a single objective: delivering the best quality end products to consumers. With that in mind, the enterprise IT department recently sought ways they could also deliver competitive differentiators to the rest of the business. After careful deliberation, the team decided to pursue a “cloud first” strategy, and began deploying new workloads to Amazon Web Services (AWS). 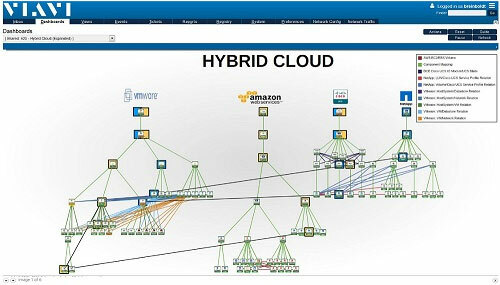 Their move to a hybrid IT model presented several challenges. One primary challenge was monitoring an environment split across the company’s datacenters and AWS. Their existing IT operations management solution did not provide monitoring for both onsite and AWS-based resources. Further, it did not provide the flexibility the team needed to discover and monitor elements that appear and disappear in moments within a cloud-based environment. After the team analyzed 24 different monitoring vendors, they opted for a solution that would give them a high level of visibility and control in the AWS environment. Today the company is able to monitor their entire IT environment (both onsite and offsite in AWS) from Observer SightOps – with 1/5 of the staff that would have been required with the legacy solution. They also benefit from the new ability to automatically detect the dependencies that exist between their AWS-based resources and their onsite resources. To find out how this company also saved the business over $2 million, download a complimentary copy of the full case study, Secrets to a Successful Cloud Strategy. Become a subscriber of the Insight Newsletter and enjoy the latest enterprise IT news and views – for free. Discover tips for improving cloud and virtual visibility, learn how to cut troubleshooting time, find out how baselines can help prevent network fires and much more.